Meghalaya's name associated with ancient history! 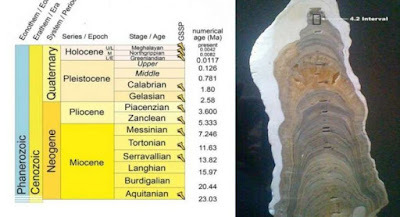 Scientists have approved three new ages on a geologic time scale of Holocene Epoch viz. Meghalayan Age, Middle Holocene Northgrippian Age and Early Holocene Greenlandian Age. These three new ages of Holocene Epoch are represented by the wealth of sediments that accumulated worldwide on the sea floor, on lake bottoms, as glacial ice, and as calcite layers in stalactites and stalagmites. Together the strata of the three new ages comprise the Holocene series. It is named after a cave in the Indian state of Meghalaya. It has helped to define climatic events 4,200 years ago, marking the beginning of a phase that continues till today. The lower boundary of this stage is defined at a specific level in the stalagmite from a cave in the northeastern Indian state. Meghalayan Age was part of a longer period known as Epoch, which reflects everything that has happened over past 11,700 years. It began with a mega global drought that devastated ancient agricultural civilisations from Egypt to China. This age is unique because it is the first interval in Earth’s geological history that coincided with major cultural event, as agricultural societies struggled to recover from shift in climate. The droughts over a 200-year period had resulted in human migrations in Egypt, Syria, Palestine, Mesopotamia, Greece, Indus valley and Yangtze river valley. The change in global climate during the Meghalayan Age was likely triggered by shifts in the ocean and atmospheric circulation. These two ages are defined with the beginnings of climatic events that happened about 8,300 years and 11,700 years ago, respectively. The lower boundary of Greenlandian and Northgripppian stages are defined at specific levels in Greenland ice cores. The ice cores are now identified as international geostandards, and have been placed in protected archives, accessible for further study. Geologists divide the 4.6-billion-year existence of Earth into distinct periods. Each period corresponds to significant events such as break-up of continents, shifts in climate, and emergence of particular types of animals and plant life. These units of geologic time scale are based on sedimentary strata that have accumulated over time and contain within them sediment types, fossils and chemical isotopes that record passage of time as well as physical and biological events that produced them. Those intervals of sedimentary strata on which ages are based are referred to as stages. Q. The name of which Indian state is associated with three new ages on the geologic time scale of Holocene Epoch that scientists have approved?